William “Frogman” Scott, 88, of Fremont and formerly of Lima, OH passed away on Friday, May 18, 2018 at the Rutherford House surrounded by his loving family. He was born September 2, 1929 in Lexington, KY, the son of Will Lewis Scott and Priscilla (Ross) Glover. 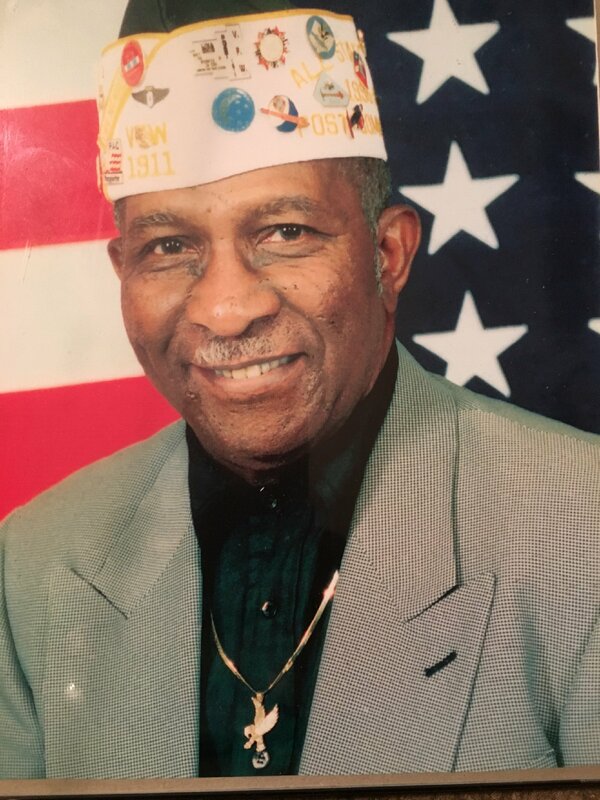 William served in the U.S. Army during WWII and was awarded the WWII Victory Medal and Army of Occupation Medal (Japan). He was privileged to be honored with an Honor Flight to the World War II Memorial in Washington DC in 2010. He married Queen E. Scott on May 4, 1952 and she preceded him in death on May 12, 1995. He then married Juanita Gordon and she also preceded him. William worked at the Fremont Foundry. He then went to work for Chrysler Corporation in Fostoria. William last worked at General Dynamics in Lima where he retired. He was an avid OSU fan and enjoyed fishing, hunting, singing, playing cards and cooking. He was a member and past commander of V.F.W. Post 1911 in Lima, OH and was a past president of the UAW retirees in Lima. William also enjoyed baseball where he played for El Dorado Bar and Grill team and was an umpire for the city leauges. He loved God, Unions, Veterans and spending time with his family. William is survived by his children, William “Billy” (Connie) Scott, Bruce (Charlene Jones) Scott both of Fremont, OH, Richard (Sabrina) Scott, Chicago, IL, James Scott, Lima, OH, Beverly Simms, Fremont, OH, Lenay Scott, Atlanta, GA, Miller Scott and Tina (Erik Edwards) Scott both of Fremont, OH, Jeremy (Hannah) Scott, Pueblo, CO; step children, William, Robert, Melinda, Brenda, Elijah Gordon, Jeanne Williams, LaTonya and Brady Greer all of Lima, OH; sister, Lucy Wade, Toledo, OH; sister-in-law’s, Ruby Tiller, Columbus, OH, Barb Tiller, Sandusky, Louise Tiller, Indianapolis, IN; special God-daughters, Angie Long and Tiffany Bates both of Fremont; twenty-nine grandchildren, fifty-eight great grandchildren and two great-great grandchildren and a very large host of nieces, nephews and cousins. He was preceded in death by his parents; first wife, Queen E. Scott; second wife, Juanita Scott; siblings, Wes Glover, Jr., McKinley, John and Delores Glover, David and Charles Scott; four grandchildren and two great grandchildren. Visitation: Thursday from 6 to 8 p.m. at Wonderly Horvath Hanes Funeral Home and Crematory, 425 E State St., Fremont, OH. Service: Friday, May 25, 2018; 11:00 a.m. at the Church on 53, 1105 County Road 41, Fremont, OH 43420 with an hour of visitation prior to the service at the church. Sending love and prayers to the family. May God comfort you in your time of sorrow. I knew Mr. Scott as Frogman because of my childhood days coming over to the house on Second Street to play with Tina. He and my dad worked together at the Foundry with others in town. My heart goes out to all of you just stay strong for each other and Celebrate his Legacy. Sending love and prayers from my family to yours from Huntsville Ala. So sorry for your lost. Our thoughts and prayers are with you. RIP Mr. Scotty! You will forever be missed. I remember out last talk about the Army when I came home. I’m honored to have know you ! Thank you also for your bravery and service to this great country. Sending prayers and good vibes. May all family and friends remember all the good times and cherished memories. So sorry for your loss , he was a very honored man. Serving his country and to come out of it was a blessing. He was truly loved and respected by anyone that crosses his path. I enjoyed the pictures on FB showing how he was loved by his family. Billy I’m so sorry for your lost your my brother in heart. Sending prayers for this family I know he will be missed. We were so honored to get to know William. He, and his family, have left a mark on all of us. We grieve with you, laugh with you, and please know, we cherish the time we had with you all. You will always be a part of our family now. Sending our condolences, he served his country and his family with love and honor. May God continue to give your family peace during this time of sorrow. May the Holy Spirit comfort you during this time. You are in our prayers. I’m so sorry about your dad. Be proud of the daughter you are and what you did for him! !